Nov 19, 2007 – Ido Zoldan, 29, of Shavei Shomron was killed in a shooting attack near Kedumim in the northern West Bank, when terrorists opened fire from a passing car at around 11:30 pm. Ido Zoldan was buried in Kedumim. 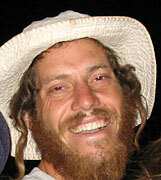 He is survived by his wife Tehila and his two small children, three-year-old Aharon and one-year-old Rachel. The three members of the cell were Palestinian policemen and members of the Palestinian National Security Force, which Israel and the United States have been investing in as part of the international effort to strengthen Palestinian Authority Chairman Mahmoud Abbas and his Fatah government. Yes, maybe this plan needs to go back to the drawing board for a little rethinking. This entry was posted on Sunday, December 2nd, 2007 at 11:40 pm and is filed under General. You can follow any responses to this entry through the RSS 2.0 feed. Both comments and pings are currently closed.